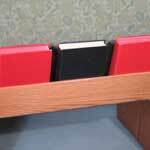 The Marshall Company has a complete line of accessories, ranging from durable and comfortable kneelers, to coffee cup holders for your pews! Marshall’s own kneelers incorporate a solid hardwood inner kneeling board, not plywood or particleboard, for added strength. 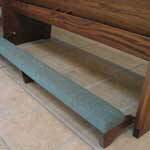 We use a high density kneeling foam, and quality fabric or nagahyde covers for durability. 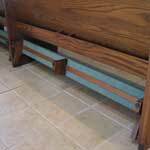 The kneeler legs and supports are manufactured using solid Northern Red Oak, just like our pews, so they are not only functional, but look beautiful as well. 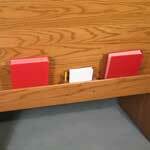 Marshall’s bookracks come with numerous options, including card and pencil holders and communion cup holders. 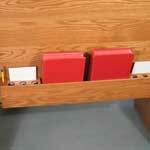 They can also be manufactured in various lengths, with one, two, three, or four book capacity. 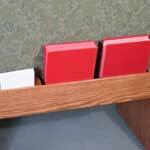 For maximum capacity, our continuous bookrack runs the entire length of the pew, and is routed into the ends and supports for added strength. Web Development by Implied By Design LLC.